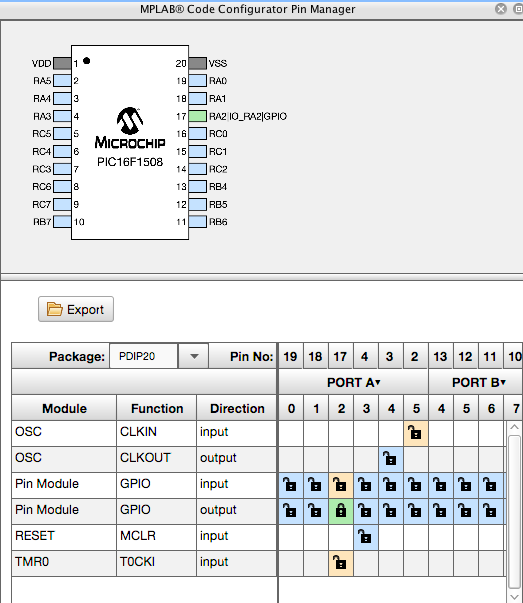 The Timer 0 module is a 8-bit timer/counter within most PIC® MPLAB® Code Configurator (MCC) devices. The Timer 0 can also trigger an interrupt when it overflows. 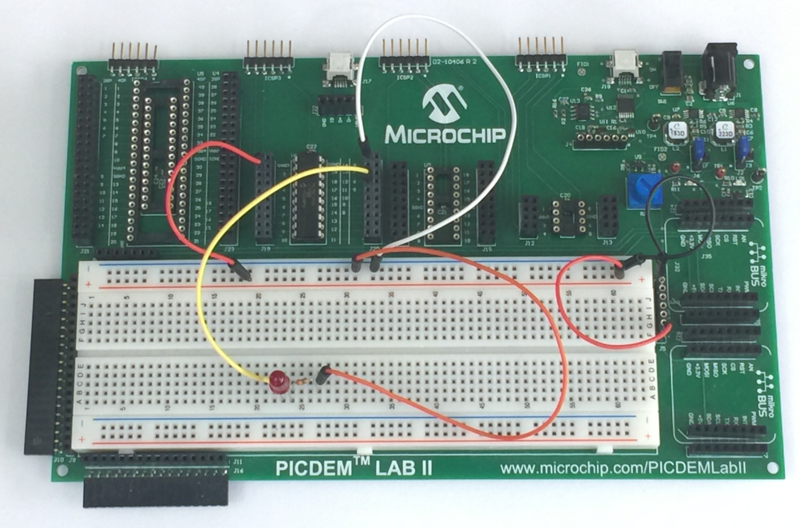 This project will create a blinking Light Emitting Diode (LED) based on a Timer 0 Interrupt Delay. 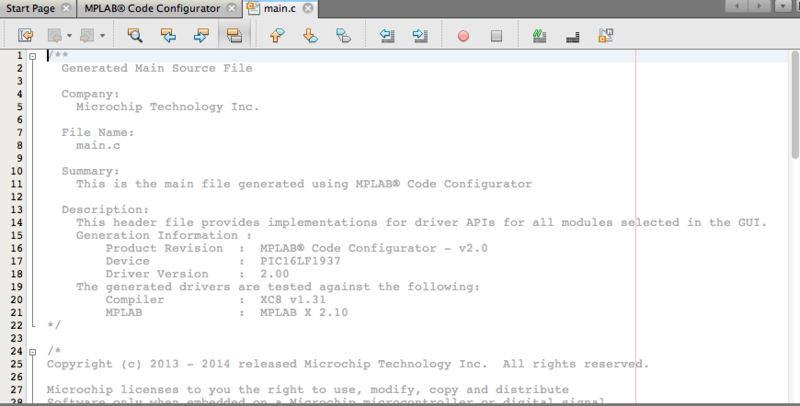 To follow along with these steps, MPLAB X should be open and the Programmer/Debugger connected to both the computer and the Development Board. 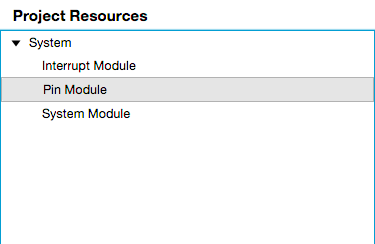 The setup is described in the "Setup and Installation" section of this training module. You should see a screen similar to the one below to move proceeding to step 1. 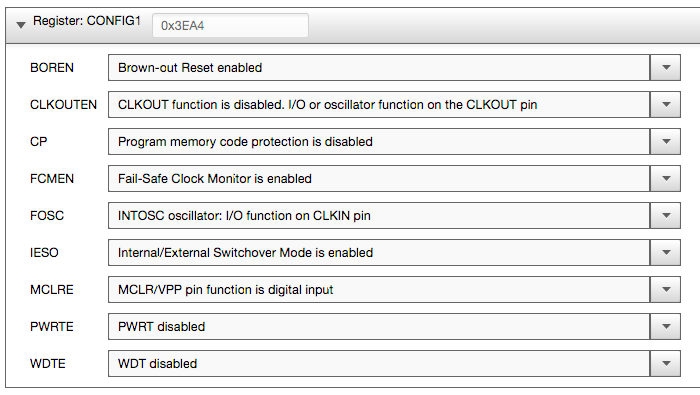 Select the 'INTOSC' from the drop-down menu for the System Clock Select. Select the '1MHz_HF' selection from the Internal Clock drop-down menu. The Timer0 needs to be setup. 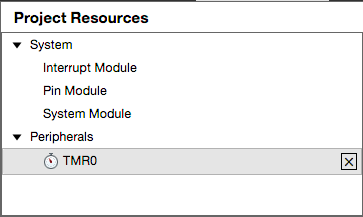 Click on 'TMR0' under Project Resources to make the Timer0 setup screen appear. The Timer 0 will be driven by the instruction clock which was set up in step 5. Set 'Clock Source' to Fosc/4 (This is the instruction clock). Set the Prescaler box to 1:256. Set the 'Timer Period' to 250 ms (The Reload Value should automatically adjust). Check the Enable Timer Interrupt box (This will add the Interrupt Manager to the Project Resources). The Interrupt Manager should be reviewed. Click on 'Interrupt Manager' under Project Resources to view the setup screen. 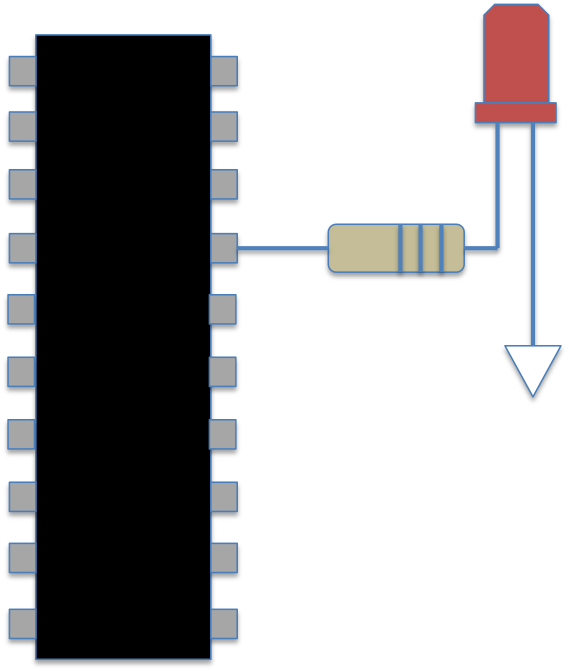 The Timer 0 will be shown as an interrupt source which was setup in step 7. Note the message: "Please remember to enable the Peripheral and Global Interrupts in your code!" This will be setup in the main.c file of the project code. There are two files that need to be modified for this project: main.c and tmr0.c. These are the main code file and the timer 0 code file. They are modified as described below. The main.c file requires a few lines to be uncommented for the interrupt to work properly. 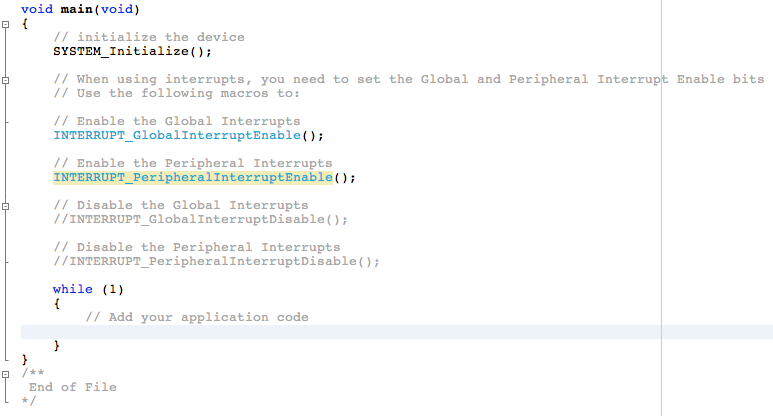 To enable the interrupt to work, Global Interrupts and the Peripheral Interrupts need to be enabled. The MCC already has the control commands in the default main.c file, they are just commented out with two forward slashes (//). The forward slashes need to be removed to enable these lines of code. The main loop does not require any additional code beyond the default while(1) loop. 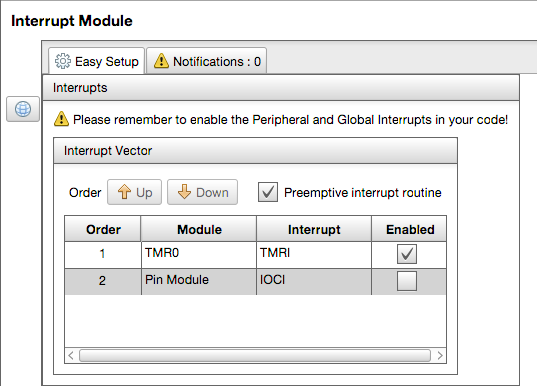 The Interrupt Service Routine (ISR) will handle the changing of the I/O pin. The tmr0.c file contains the ISR that will run when the interrupt occurs. This is where a function to toggle the LED pin is entered. 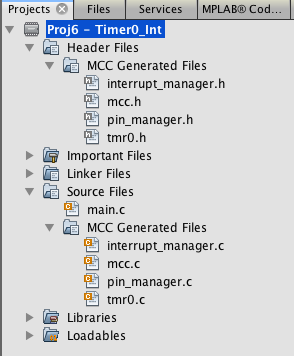 The function used is the IO_RA2_Toggle() macro that is created by the MCC and placed in the pin_manager.h file. 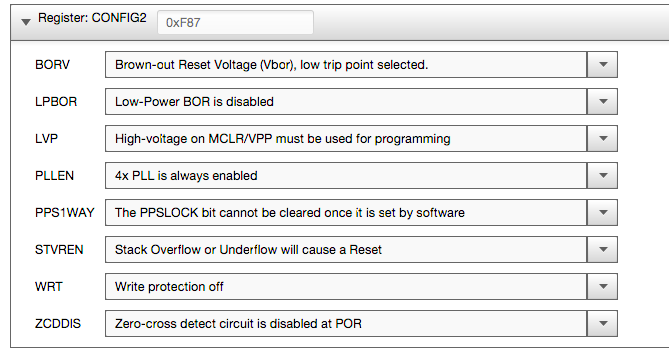 This IO_RA2_Toggle() is added to the ISR as shown below. 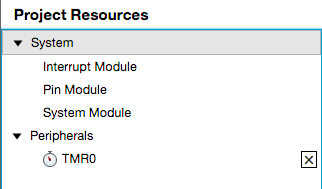 Click on Build Project (hammer icon) to compile the code and you should see a "BUILD SUCCESSFUL" message in the Output window of MPLAB X.
RealICE cannot power the development board so powering the board separately is required. The RA2 LED will blink at a 250ms rate on then off. 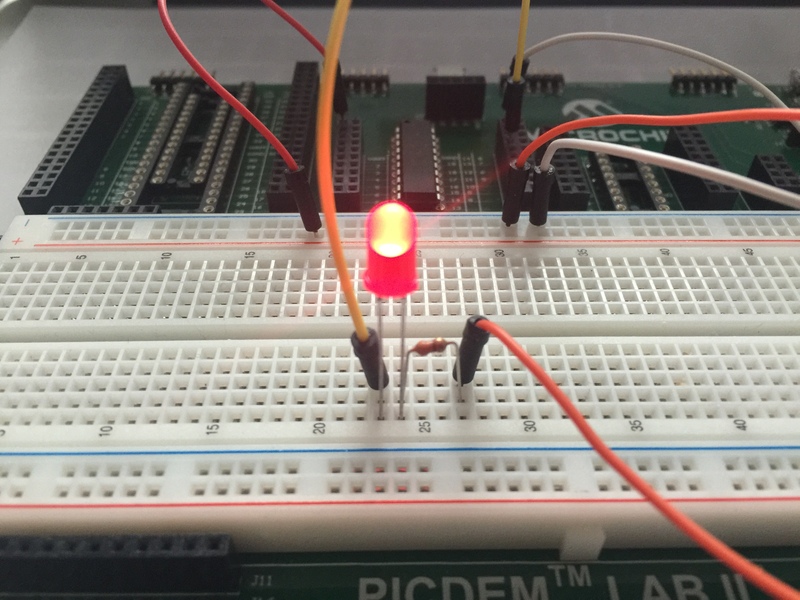 The picture below shows the LED caught in the lit position but the application should blink continuously. 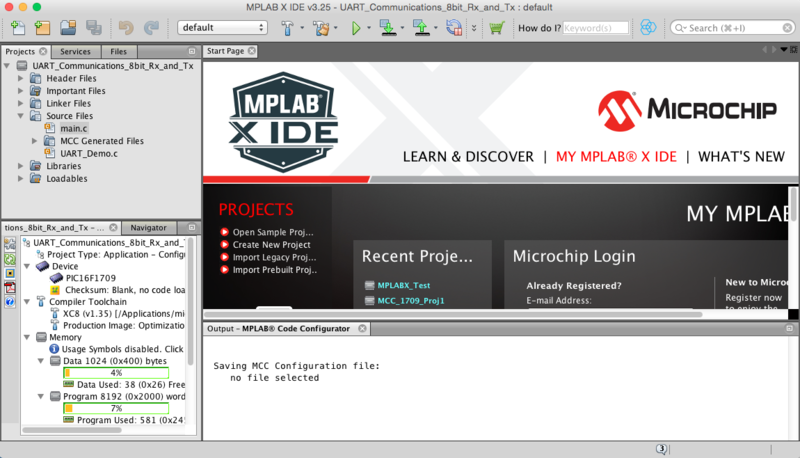 The project can be closed in MPLAB X. The project is saved automatically when it is built but any changes to files or configuration may ask to be saved before the project is closed. 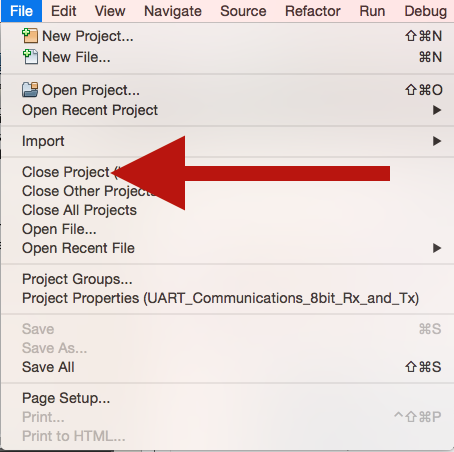 The project can be closed under the File > Close Project.